So You Want to Start Sailing? There are in excess of a 1000 Sailing Clubs in the UK alone, generally situated on the coast or the Inland Waterways, with membership usually open to all whether a beginner or an experienced Skipper. With families welcome, they offer a fantastic opportunity to spend time out on the water and socialise with like-minded folk. If you are new to the sport, or are interested purely in the recreational side, joining a Sailing Club is an inexpensive way of getting yourself (and your family) involved. Most clubs have a clubhouse, including a bar, and offer the facilities for easy access to the water. You don’t even have to own your own boat with many Sailing Clubs having club boats available for use by members. Also via the Sailing Clubs you can keep up-to-date with news of local or regional activities, such as boating regattas or racing events. You may just fancy being a spectator for the day to watch and learn, or, you may even be able to take the opportunity to take part either in the event or as a support volunteer. Arguably the best path to take as a sailing beginner is to join a training course. There are hundreds of RYA accredited training centres around the UK. Most training centres offer the opportunity to try sailing before you enrol, so it is always worth asking whether this is possible. The RYA National Sailing Scheme provides a series of courses to ensure you learn all the basics of handling a boat giving you the skills and techniques to start sailing safely and with confidence. There are several options with which you can then progress depending upon your ultimate goal, whether that is sailing for recreation or sport, or gaining the ability to sail at an intermediate or advanced level. The choice is yours. In many cases a Skipper cannot sail his boat without crew. Search the internet or check the noticeboards at your Sailing club and you will always find adverts (and companies recruiting) for ‘Crew members Wanted’. There will always be a market for professional and amateur crew with opportunities available all around the world if you fancy doing a little travelling at the same time. The role as a crew member will vary dependent upon the voyage or assignment but in general can include deck-hand duties, watch duties, cooking and assisting with maintenance / cleanliness of the boat. Aside from the sailing practicalities it is also about having fun and making the most of exploring the idyllic features of the ocean and coastlines. Some sailing experience is preferable in most cases but there will still be opportunities for the inexperienced sailor. The incentive is there however, to progress through the training courses and build upon your practical experience. Obviously, the further you progress the greater the range of opportunities open to you. A popular starter choice for many, albeit not technically sailing, booking and taking a holiday on the inland waterways is an excellent way to get to grips with basics of handling a boat. Whether it’s on a Narrowboat navigating the scenic Oxford Canal or a Riverboat cruising the Norfolk Broads, it offers a great opportunity for recreational boating. A positive aspect of trying this first is that no boating experience is necessary. All the hire companies will teach you the basics of safety and handling / manoeuvring the boat before you set off. Aside from the beautiful scenery and some great pub lunches, a boating holiday allows you to gain confidence and experience of managing and navigating your boat along the waterways. 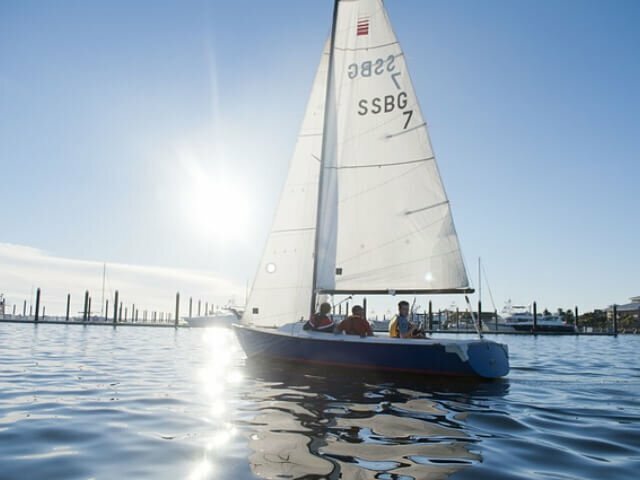 Even if not a member, it is usually possible to hire a small sailboat or dinghy from your local Sailing Club for a morning / afternoon’s sailing. This provides a relatively inexpensive way to spend some time on the water and test your newly acquired skills, assuming you’ve taken your beginners course(s). A(nother) quick search on the internet and you’ll find a number of companies offering boats for hire or charter for an extended period. In most cases these days, primarily for safety reasons, you require some sailing experience should you wish to hire or charter a larger sailing boat or yacht. In this case, your charter yacht is therefore managed by a suitably qualified Skipper, the upside being you can have the best of both worlds – time out on the water enjoying the sailing experience and time to relax as part of your well earned break. Check out our article 10 Reasons to Charter a Yacht as we suggested a number of other reasons to try this aside from learning or advancing your sailing ability. If you are interested in chartering a yacht please visit SailingEurope* and Boatbookings.com* for more information. They will also be able to provide you with further guidance as to the best options available to you if you would like to book a charter break. Finding an opportunity to start sailing is not as difficult as it may initially seem. It does not necessarily require any major financial outlay and once you know where to look it won’t be long before you find yourself out on the water. As a final thought, why not put out a message on your own social media? You may be surprised how many friends or friend of friends have access to a boat and are looking for willing crew members.